Summerland is an engineering firm whose product team includes aerospace, automotive, and NASA mechanical, electrical and systems engineers, woodworking craftspeople, metal fabrication, material experts, and motor specialists. for Home, Business, Industry and Education. This page contains a model overview. Scroll or click on link to go directly to product or detailed product page. LS-512 - Training, Telecommuting, Alternative Officing, Dorms, B.O.Q., etc. LS-C - Customizable inserts (OEM) Industry compatible. LS Lecterns Mobile. Height adjustable. Convertible. We recommend the use of adjustable chairs with all computer workstations. K-4's let you get creative with pop-up critters. Brighten elementary classrooms, corporate day-care centers and libraries with whimsical pop-up Frogs, Giraffes, Elephants and a variety of other storybook creatures. Lock equipment below desk and out of the way when not in use to use the K-4 as a regular desk. With or without sliding desktop. for 4th and 5th grades through University students & adults. Accepts up to a 21" monitor and 19" CPU tower. The LS-B52 model allows secondary school and university students to collaborate in pairs or as a three-person group on a computer and still be able to comfortably take notes. The tri-unit design with 21" to 28" free-standing mobilewings, allows the 3-student squadron to separate and group elsewhere as needed. The LS-B52 model of The Learning Station is for limited space interactive classrooms, having more students than computers. The center unit is the LS-512 model. Abutting both sides of the LS-512 are "mobilewings" with movable desktops. The desktops are capable of sliding forward as much as 17" to comfortably facilitate lab-partner screen viewing WHILE those students are taking notes. The mobilewing design with pull-forward worksurface instantly creates unlimited leg room and unobstructed knee room for virtually any size student. It offers significantly better monitor viewing and more comfortable note-taking for lab-partners than any other desking option. Models for Home, Telecommuting, Hospitality. Handicapped-Accessible. Adjusts to fit virtually ANY size/height user. The OFFICE-LS model shown above and below, is available in a wide range of cabinet styles, designed to blend seamlessly with home, office and hospitality decor. It is a practical selection for telecommuting divisions. Use it standing or sitting, for computing or as unobstructed writing platform. Desktop pulls forward while in desk mode to provide maximum writing comfort for user. Equipped with Lift & Roll. Has lockable storage. Secure entire system when not in use. Options include Impact resistant polycarbonate or safety glass viewing window & peripheral cooling. The exterior styling of this unit is similar to our mobile, convertible lecterns, and if removed from the Lift & Roll equipped base, the LS-MW can also function as a standard height LS-512 model workstation. 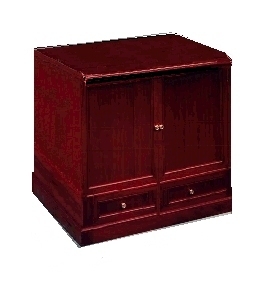 Custom sizes and configurations available, including NEMA 12 compatible, self-contained armoire models in wood or metal. (Armoire models permit full-size ergonomic chair to close up inside). Summerlift LIFT BOX model customizable inserts are sized to compliment office furniture or cabinetry offered by most major manufacturers*. Just slide the Summerlift LIFT BOX model between modules, attach it, trim to match. The Summerlift LIFT BOX model will accept standard size cabinet doors, or front shield may be finished to match any model line. Conceal media equipment in a variety of custom furnishings. OR....contact us to *Request License Info. Our company focus is on logic, practical engineering, and user-friendly designs. We concur with the majority of ergonomics experts who believe natural viewing offers the safest and most practical computing environment. There are applications, however, for which the below-desk VDT could be beautifully suited, IF it were done properly. Adjustable semi-recessed monitor models by request.